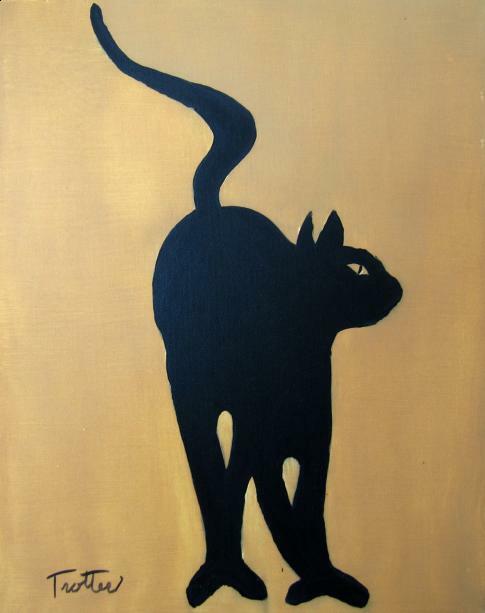 Special thanks to artist Patrick Trotter for sending in to us this picture he's painted of a black cat. Which way is the cat facing ? It depends on how you look at it, like many other "double meaning" illusions the cat can appear to be facing away from you or towards you. If you have trouble seeing it the other way try gazing at the image for a while - you should see the cat suddenly switch directions, see if you can get the image to switch back and forth. this is sooooooooooo damn awesome! This is good but don't think it's great. It took about 20 secs to finally get it n it isn't fantastic. this is ok!!!!!!!!!!!!!!!! but not great!!!!!!!!!!!!!! ohhhhhhhhhhh....I got it!!!!!!!!! KEWL BEANS!!!! wow that's so cool!i got it! OMG that was sooo fliping freaky man lol!!! hahahahahahaha!!! i figured it out at first but then its gone!! but than i took like another 5 mins to figure it out again! That took me forever to get! 12 seconds in, I don't get it! 1 minute in, OOOOHHHH!!!! NOW I see it!